Soon after the Sun enters your sign, I'll have an extended reading for you. My readings are highly practical sources of information, inspiration and motivation. 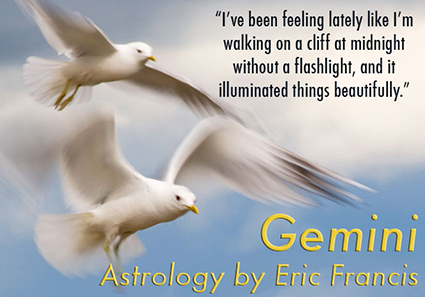 These readings morph the best of my work as a Sun-sign astrologer and a professional counseling astrologer. When I developed this method, I thought it might work pretty well, but I've been amazed at the response I've had. I speak directly to you in plain language, in studio-quality audio -- it's like I'm sitting right in the room with you. They are divided into three sections -- two astrology segments of about half an hour each, and a section of astrology afterthoughts and a tarot reading. Astrologically, I will cover the unusual Mercury retrograde that happens in Gemini, the highly unusual grouping of planets that's working its way across your relationship angle, and what it could possibly mean to have the planet Chaos in your sign. I'll also go over the influence of the grand cross, and focus on Uranus square Pluto and the impressive influence of Chiron and Neptune on your career. The reading is accessible and playable on any kind of computer or mobile device (smartphone, iPad, etc.). It includes a live question and reply forum where you can ask me questions directly, which will be held right around the New Moon (archived for those who cannot make it), as well as access to last year's reading, so that you can review and check my accuracy. Plus you get an extended written description of your birth sign. And there will be some fantastic original theme music composed by Daniel Sternstein. It'll make an awesome gift for you if you have Gemini Sun, Moon or rising, or for the Gemini in your life, and is now available to subscribers for the pre-order price of $19.95. Early purchasers get the lowest price. After publication the reading will be $39.95.